Body Transformation: Focused, Fueled, And Ripped! Wrestling taught Josh to diet like a champion and work like a beast, but a massive college workload diverted his priorities. See what reenergized his fitness focus! I wrestled for four years in high school and coached for two years. I started going to the gym in high school and did everything possible to stay in pristine shape for wrestling. I did well my first two years because I was stronger than most competitors. I never placed lower than second at any tournament. My last two years of high school, I wrestled at provincial level and almost made it to nationals. However, when college came, I experienced the famed freshman 15, then 20, 25, and more. I left high school at roughly 160 pounds, but the paramedic program in college took all of my free time and left none for the gym. I was a full-time student, ate when possible, and only managed to be at the gym 2-3 days per week at best. I spent 60 hours per week in the ambulance for field experience and my down time was spent studying for upcoming tests. My sleep schedule was messed up because I worked nights (7 p.m.-7 a.m.) and my classes and tests were in the morning. Due to that, my eating habits were off track. I wanted to change my body back to the way it used to be. I always valued pushing my body to the limit and there's nothing I wouldn't do to reclaim it. 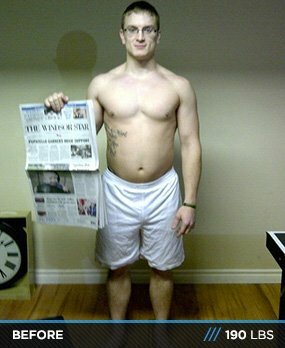 I entered the 2013 100K Transformation Challenge on Bodybuilding.com to motivate me to eat better and exercise regularly. I love being in the gym and weight training more than sleep. I sincerely missed being able to train hard, so I challenged myself. If you want to see a man cry, stick around after my leg workout when the down escalator at the gym is broken. After getting into shape again, I feel better, sleep better, have more energy, and my friends and family are encouraged to change too. My mom is down 12 pounds in the last 12 weeks. Considering her age, I'm impressed! I accomplished my goals with a good work ethic. I learned how to lose weight from wrestling, so fitness wasn't a mystery. My major obstacle was sacrificing down time to precook meals for upcoming work days and getting to the gym after a 12-hour shift at work, which took serious motivation and drive. Admittedly, I slacked a bit at first, but was able to pull my socks up and keep going. I motivated myself with pictures from previous transformation challenge winners. I thought, "If they can do it, why can't I?" People have transformed their bodies for years and I knew it was possible. I started my diet by cutting out extras. First, I cut pop, sweets, and fast food, and then I looked at my weekly progress photos. I felt better, slept better, and had more energy. This in itself was motivation. I got my nutrition in check and ate carbs in the morning and fats and proteins later in the day. There were always obstacles. My family has a tendency to eat dessert at least three nights per week. After that, if they play a card game or have friends over, there are chips, pop, cake, and other junk food involved. Some days, if they had friends over, they would have pizza for dinner because it was easy. I had to be in the kitchen cooking a chicken breast and cutting up veggies, but knew it was worth it. I kept a steady breakdown of my diet. I ate 5-6 meals per day that were 300-400 calories each, which totaled 2000 calories per day. I lifted four days per week and did cardio 3-4 days per week. My biggest challenge was finding motivation to work out after a 12-hour work shift. The best way to get through was with a solid pre-workout product. I had to be careful to time it properly so I could sleep after the gym. Sometimes it was best to skip the pre-workout. My future fitness plans are, and always have been, to compete and get on magazine covers, and be a spokesmodel for a company. Find motivation: You need something to keep going. If you don't have the drive to do what is necessary, you are guaranteed to fall off track. Be realistic: If you're new to fitness and nutrition, make a realistic goal. If you have lots of weight to lose, think it terms of years, not weeks. Work hard: The generic "work hard" statement fits anything worth doing. However, when I say work hard, I mean go into the gym realizing that throwing up or passing out is always on the table. Sleep and hydrate: Sleep and water are absolutely necessary for your metabolism and recovery. I aim for 3 liters per 100 pounds of bodyweight. I've been a member for a long time and have browsed most categories on the site. I recently started looking at the hundreds of transformation stories and photos. It helps to find someone with similar body stats as you to get a mental image of yourself in the before and after.